Mount Wutai is not for casual tourists who are willing to spend just a few hours there before rushing to the next county for more photo opportunities. The mountain, named for its palm-like shape, covers some 600 square kilometers. I wonder if any traveler has scaled all five of the peaks, the tallest being the North Terrace at 3,061m. They are all quite flat at the top, but getting up there may force you to go through several seasons, and you may end up face to face with remnants of glaciers. Emperor Qianlong (1711-1799) of the Qing Dynasty (1644-1911) made it his goal, but he had to settle for the Blue Snail Peak, which has the height of a 130-story building. It is a temple that assembles Buddhas from all five peaks, so he could simulate the experience by trekking up the 1,080 steps. Nowadays tourists do not even need to walk. A cable car ride will do the trick. 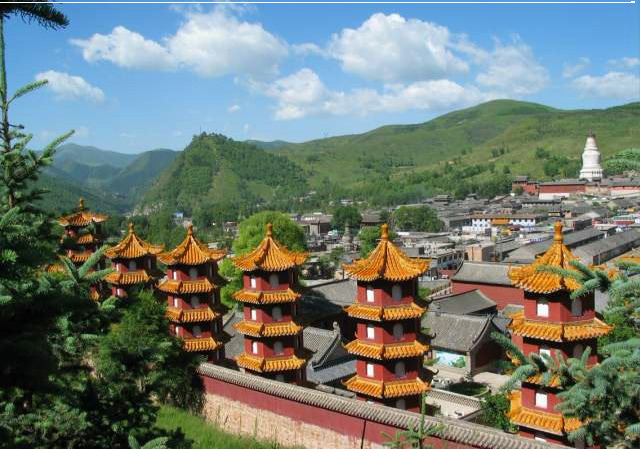 Mount Wutai is a sanctuary for Buddhists. At its height in the Tang Dynasty (AD 618-907), there were as many as 360 temples. Now only 60 remain, covering an area of 300 sq kms. If you want to pray and meditate at each of them, it will take you weeks. Fortunately, they have a dummy version for everything. I rushed through four - in one morning. My prayer sessions lasted about 15 seconds each, and I didn't burn any incense. My parents would kill me if they know I wasted such a golden opportunity. They may not have crawled up the stairs like some of the more pious pilgrims, but they would surely have spent hours in each compound. Yes, a temple here is not a single building, but multiple buildings with walls and an imposing gate. The most ubiquitous god at Wutai is Manjusri, the Bodhisattva of wisdom. This explains the throng of college-bound students and their parents, who implore him for higher scores. In this post-national entrance exam season, they have come back to express their gratitude because their erstwhile prayers have been answered. I don't know the etiquette for those who failed. Should they come back to say "Thank you for nothing" or should they stay at home and mope? Surely, you should not hold grievances against a god. The funniest scene is that of a wall painted with a giant fo, the Chinese word for Buddha. The last stroke happens to go all the way down and I noticed many youths clinging to it and rubbing it so much it has lost its color. It turned out that they were hanging on to the Buddha's foot, a metaphor for last-minute cramming. On the contrary, the pilgrims personified patience. Some had journeyed from Tibet. Wutai is the place where Tibetan Buddhism and Han Buddhism coexist in harmony. Some even came from other Asian countries. 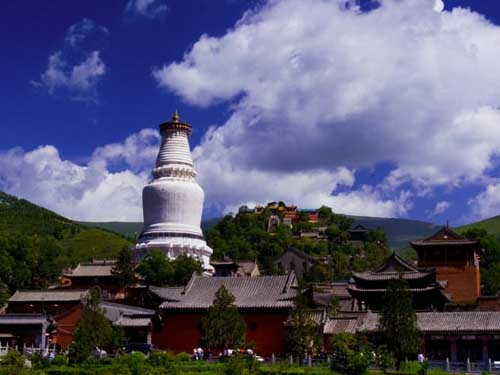 The best-known symbol of Mount Wutai is the white pagoda, the kind you see everywhere in Tibet. The 56.4-m structure dates back to 1302, when a Nepalese monk used small stones to erect it. Its base is encircled with prayer wheels. There is a pavilion nearby with one big wheel. My guide instructed me to "go around the big one three times and the small one once". Off I went and finished the holy task. On my way out I found, to my dismay, that I had made a mistake. What he meant by "big wheel" was the bigger structure, not the size of the wheels. I had done the opposite. How was I going to make amends? There is a compound attached to Tayuan Temple, where the white pagoda sits. It's called "the residence Mao Zedong passed by". On April 9, 1948, the Chairman and his entourage slept here for one night. You don't believe it? There is a blurry photo blown up for all to witness. In the room recreated for its authenticity, there is a prayer cushion in front of his statue.